American bullfrogs (Lithobates catesbeianus or Rana catesbeiana) are sizable brown or green amphibians native to North America. The family Ranidae creatures display protective behaviors in a variety of different situations, including territorial protection, mating and threat of predation. Fully mature male American bullfrogs are highly turf-oriented creatures. 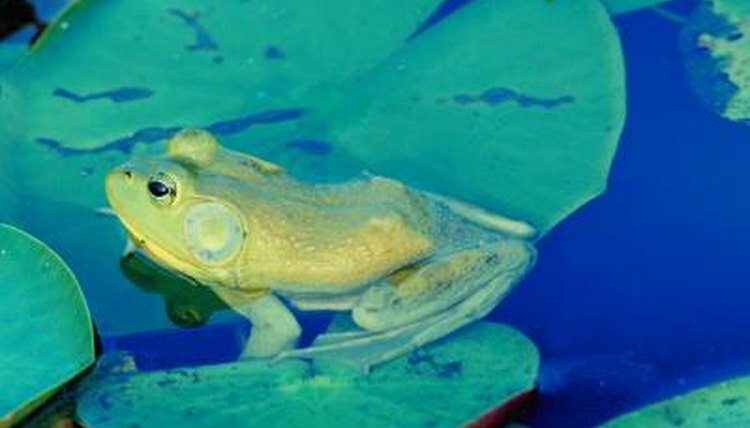 When they feel that their personal space is at risk of invasion from another frog, they attack by grappling, with lots of leaping and running pursuits. American bullfrogs do not think twice about kicking or smacking their adversaries, either. American bullfrogs frequently employ defensive vocalization as a means of protecting themselves. By calling out, their goal is to ward off danger, whether from fellow frogs or other types of creatures entirely. This defensive call is rapid and has a jarring, piercing and unpleasant sound to it. Their "inviting" call, on the other hand, sounds totally different, with a deep and clear quality. Members of this species have pretty substantial mouths that are capable of inflicting some intensely painful bites on unsuspecting individuals who come their way. They have extremely small teeth that are highly effective for tightly seizing onto things. American bullfrogs are in no way exempt to the dangers of predation. Some of the species' most prominent predator risks are raccoons, water snakes and turtles. A lot of birds frequently go after American bullfrogs, including great egrets (Ardea alba) and great blue herons (Ardea herodias). People also sometimes go after these bullfrogs for acquiring their flesh. Their legs are often served in restaurants. American bullfrogs of all ages are susceptible to the hazards of predation. Although the moniker "bullfrog" by itself often describes the American species, another bullfrog variety is out there -- the African bullfrog (Pyxicephalus adspersus). Like American bullfrogs, the African amphibians can get extremely defensive about territory and breeding, frequently even partaking in deadly physical battles with each other. One of African bullfrogs' protective mechanisms involves puffing their bodies up into massive, balloonlike shapes. They do so using air. This is a means to fool others into thinking they're much bigger -- and more intimidating -- than in reality. When they puff out, they often double their physical volume.